In part 1 Georige Gillis covered the mechanics of breathing when singing. Part two covers some basic mindsets and editing techniques when editing vocal breaths in Pro Tools. There’s a few schools of thought when it comes to editing vocal breaths in mixes. Do you leave them in, cut them out completely or shape them? They all have their uses and if understood and used correctly can easily support the overall feel of any vocal in a mix. Consider breaths as part of a vocal melody line… an un-pitched “note of feel” which can be shaped in duration and fade to compliment the first pitched note of a sung phrase. Leaving breaths in can support feeling and emotion in a lead vocal. Cutting them out can strip away a bit of the performer’s vibe and delivery but does provide space and tightness around the melodies for instrumentation in a mix. A rule of thumb when editing backing vocal breaths, especially if they are stacked, is to cut them all. This will avoid the sound and impression of many people gasping at the same time. Leaving backing vocal breaths in a mix can easily upset the entry of vocal harmony melodies so I personally don’t consider backing vocal breaths to be a “note of feel”. 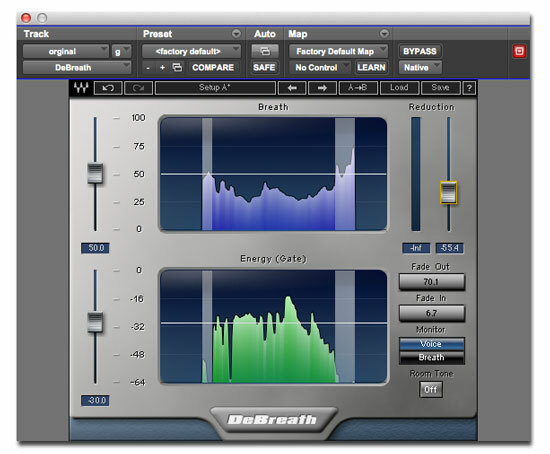 Below are four methods for editing out breaths in Pro Tools. A noise gate used as an insert work well for not letting breaths past the threshold as many breaths will be quieter than the lead vocal itself. However, noise gates don’t always work well if the vocal performance varies a lot between loud and delicate dynamics. You may need to automate the threshold in parts so that the noise gate can work with both loud and quieter sections of a vocal; opening and closing correctly with your desired attack, hold, ratio and decay settings around the vocal melodies. Strip silence operates kind of like a noise gate but where it differs is how it physically chops audio away from the audio clip within the edit window. Similar to noise gates, a threshold needs to be set in order to determine what low level audio will be stripped away from the audio clip itself. Strip silence works well if you work in small sections as opposed to applying it once across an entire vocal take. Working in small section at a time will enable you to adjust the length values for each section. With assistance from Edit > Fades, this can be a simple way to cut out breaths and unwanted voice artefacts between melodies. There are a few third party plugins available which can easily attenuate breaths. The one I use, when time is of the essence, is Waves DeBreath. This simple, yet useful plugin takes a lot of the guess work out of editing breaths where noise gates and strip silence can be a not always the best solution. It sounds great but does introduce a lot of latency if used as an insert. A great way to use DeBreath is to use it firstly as an insert so that you can monitor the reduction of the breaths and the fade in/out times. Once you have tailored a suitable balance in the insert you copy and paste the settings into an AudioSuite version and process directly to the track. I like to take the time in the edit window to go through each line of a lead vocal with the multi-tool selecting and removing the areas within an audio clip I don’t want and creating fades before and after the melodies. This enables me to craft the length and crescendos of all the breath notes. I’m not a big fan of removing all the breaths from a performance as to me it sounds a tad unnatural. I like to tailor each and every entry of a vocal line so that it feels right in the mix and sympathetic to the arrangement. I find if I am going to spend time with strip silence or automating noise gate thresholds I may as well go through and edit manually. Once you have some experience and practise editing breaths this way it should only take a couple of passes of the whole track to tidy to your taste.